Broadcasting live from Reflection Bay Golf Club at Lake Las Vegas, Andy and Tony are joined by. . .
Scott Comings (Celebrity Chef, Lake Las Vegas): Stops by to remind everyone of the Lake Las Vegas Birthday Wine and Food Fest May 4th & Lake Las Vegas Drive 25 on May 11th. 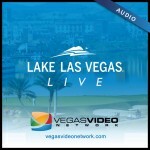 In a very special episode of Lake Las Vegas Live, Andy and Tony are joined by Pat Parker, (President, Raintree Investments). Together, the three talk about upcoming events in and around the lake, highlight a number of new communities becoming available, and provide a first look into “23 Summer House”, the breathtaking new show home on the banks of Lake Las Vegas. Broadcasting live from the Lake Las Vegas Sports Club at Lake Las Vegas, Andy and Tony are joined by. . .
Jackie Arcana (Fitness Director, Lake Las Vegas Sports Club): Bringing fitness to LLV residents and what it takes to be a triathlete. Then, information on the upcoming Regatta as well as other big events happening soon!! Broadcasting live from Seasons Grocery at Lake Las Vegas, Andy and Tony are joined by. . .
Gene Northup (Synergy Sotherby’s International Realty): Looking for waterfront lots? Gene can help. Then, FULL COVERAGE of the Golf Cart Mardi Gras parade!! Broadcasting live from the Vegas Video Network Studios, Andy and Tony are joined by. . .
Siera Naegle (GM Seasons Grocery & Deli): Highlights this weekend’s Lake Las Vegas Mardi Gras parade. Jim Andersen “The Coach” (Lake Las Vegas Rowing Club): The Lake Las Vegas Rowing Club hosts the 3rd Annual Collegiate Invitational Regatta.